At Last, My Ship Has Come In! Anyone who knows me, is familiar with my deep curious streak. I find myself wondering things that are sometimes obscure, and wanting to get to the bottom of them. When I was in Bermuda back in May, I watched cruise vessels come and go. There was nothing particularly curious about that- until I learned how they actually get to port. They are not brought into port by Captains of cruise lines; they are brought into port by Bermudians. Needless to say, this intriguing fact lingered in my head, long after I returned to New York. Spurred by my inquisitive nature, I wrote to Bermuda Marine and Ports requesting to witness the piloting of grand ships with my own eyes. What a fascinating article, this would make, I was certain. 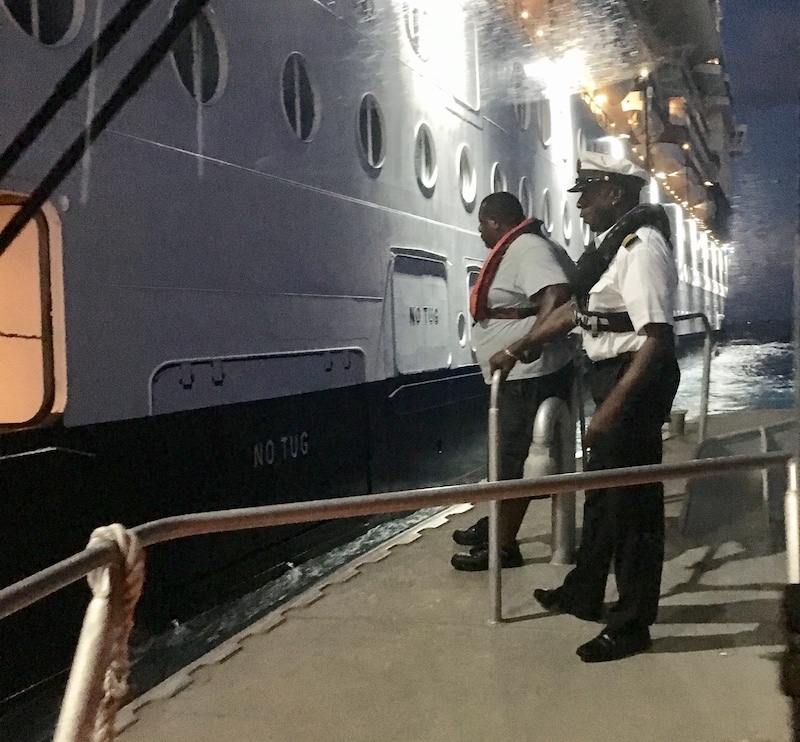 While waiting to hear back from the powers that be, I studied the Bermuda Cruise Ship Schedule online, seeking to estimate how many visits to Bermuda are enabled by their trusty Harbour Pilots. Considering the prospect that Harbour pilots must be few in number in Bermuda, I sought to know many tourist visits are enabled by each one? It must number in the tens of thousands… Without them, what would happen to the mainstay of tourism? Even though ‘airlift’ is increasing, the cruise ships are absolutely vital to Bermuda’s economic welfare. Simple research revealed astounding numbers. 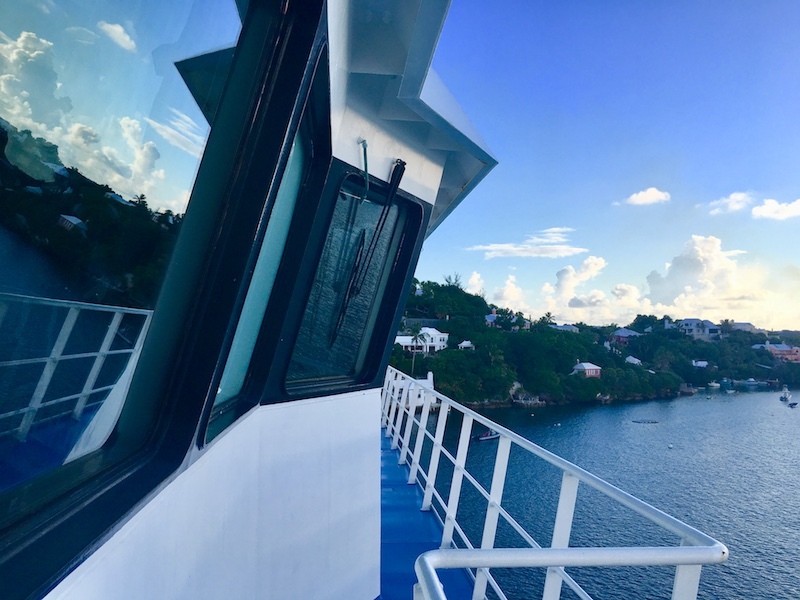 According to Bermuda Marine and Ports, Bermuda has 106 visits by ‘Regular Callers’; these include Grandeur of the Seas, Anthem of the Seas, Norwegian Escape, Norwegian Dawn and Celebrity Summit. These five ships alone generate an average number of visitors to Bermuda (per ship, per season) ranging from 39,096 (Grandeur of the Seas) to 106,800 (Norwegian Escape); these numbers are for passengers only- not crew. Crew sizes for these vessels range in size from 840-1651 personnel, per voyage. 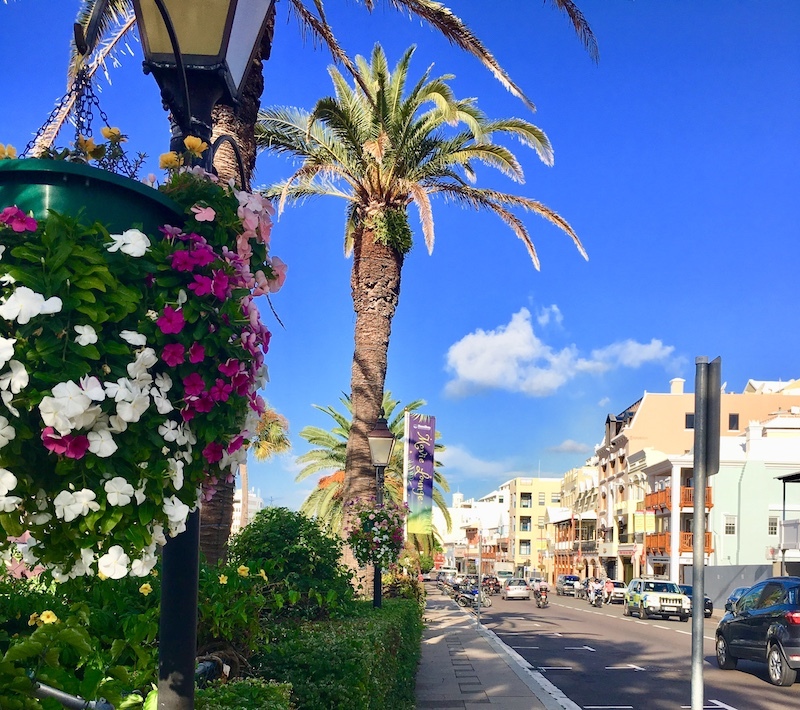 By crunching just a few numbers, one can begin to fathom the immense impact of the cruise industry on Bermuda’s economy- even if all cruise personnel stayed onboard, while in port. 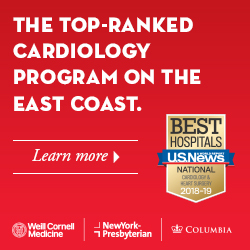 Along with the ‘frequent fliers,’ there are seventy-four (74) visits from “occasional callers”- smaller cruise ships that bring tens of thousands of visitors and crew to the island every season. These range in size from the Hamburg (with an average capacity of 359 passengers and 373 crew per visit) to The Carnival Horizon, which accommodates an average of 4121 passengers and 1450 crew, per visit. Having completed my initial data search, I was delighted to hear that the Pilot Warden in Bermuda would welcome a story about pilotage! 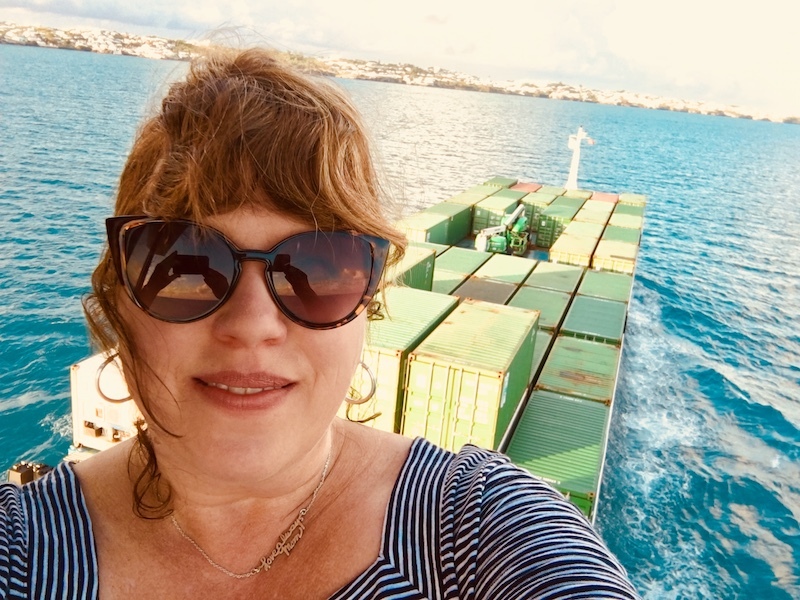 He explained to me that the pilots not only meet the cruise lines outside Bermudian channels- but also the freighters that sustain Bermuda’s livelihood. 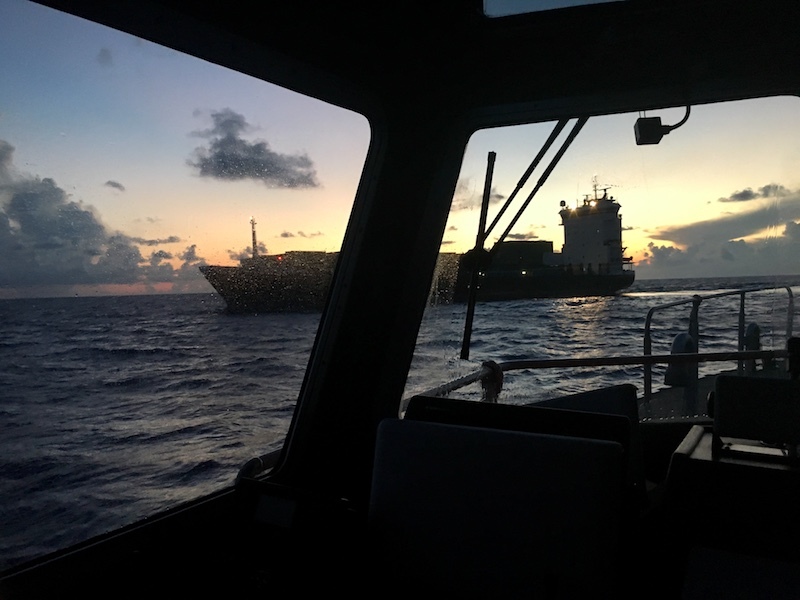 I was told that I would need to receive appropriate permission, as a writer, from both Customs and the Bermudian Marine Authorities, if I were to accompany the harbor pilots out for a morning’s work. I was asked to scan my Passport to the Pilot Warden, in advance, for clearance. From the outset of my request, the Pilot Warden was candid with me about security regulations. There was a ‘near zero’ chance that any passenger ship would permit a writer to accompany a pilot onboard. “The bridge of a passenger ship is a sacred space”, he said. I understood. With up to six thousand passengers to protect, it made perfect sense. I had not even considered the date; our outing would take place during the week prior to September 11th. Thankfully, I arrived in Bermuda during a time of plentiful passage. A container ship would be arriving concurrently with the two cruise ships that Wednesday. They welcomed an American writer onboard! 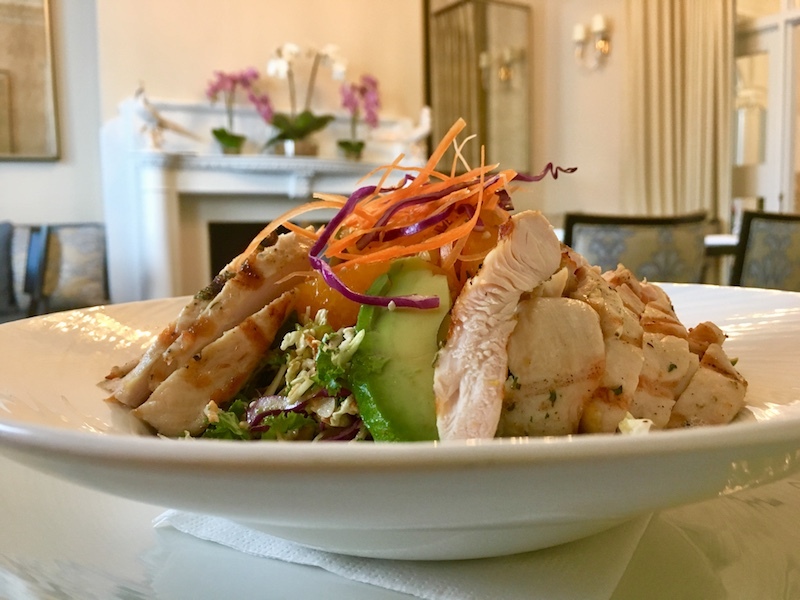 As I waited to hear from the Pilot Warden about ‘the plan’, I headed to Huckleberry in Hamilton for a delicious lunch and familiar camaraderie. As the sun went down over Salt Kettle Bay, I received a call that a taxi would be in the driveway at 4:45 am the next day, to pick me up. To appease my worries that I would not wake up, the Pilot Warden called me himself, and sent a text that read, “Good Morning! 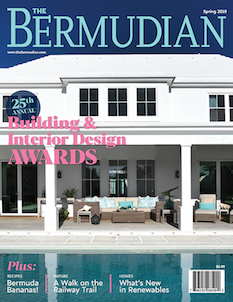 Time to rise and shine!” How very Bermudian. With a mere three sips of coffee in me, I waited in the driveway, next to the red hibiscus bushes; they were still sound asleep. 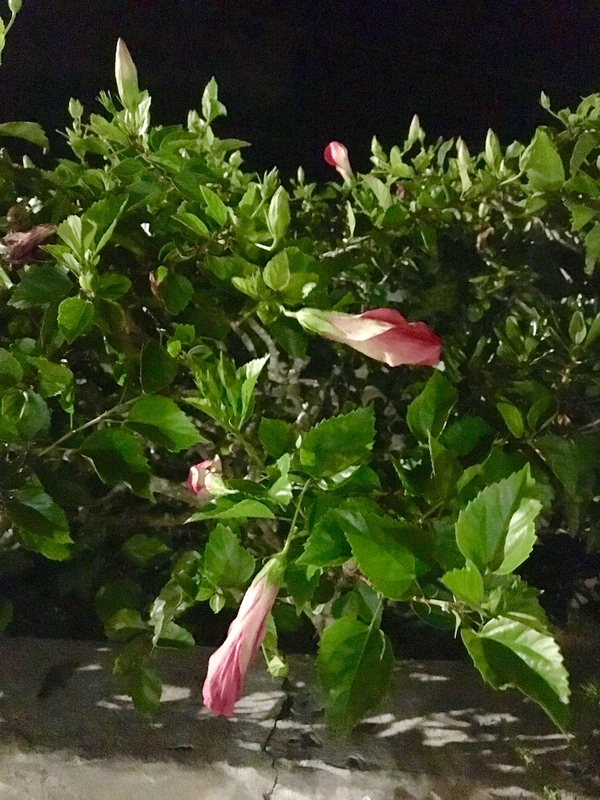 Unbeknownst to me, Hibiscus flowers close up into buds at night. Another wonder of nature! The tree frogs peeped, as I looked for headlights. When the taxi drove up, I felt comfortable in my casual nautical look from Talbots. Two uniformed men (a First Class pilot and trainee) were already inside the taxi, that had originated in Somerset; they were dressed in beige dress. As we made our way to St. George, we picked up additional Pilots (including the Pilot Warden)- dapper in their uniform whites, complete with hats. It is a funny cultural commentary that the vision of military-style dress whites sparked memories. The theme to “An Officer and a Gentleman” inevitably played in my head. All of a sudden, I recalled a date that I had been on in New York City- back in the day- with a young man in the Navy, who showed up at my office in full uniform. The ladies in the department, where I worked, naturally expected that he would “pick me up”- like Debra Winger. Anyway, that is neither here, nor there! 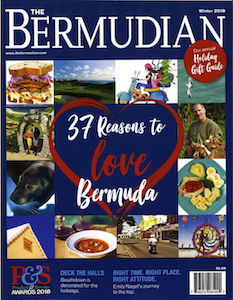 As I rode along the windy Bermudian roads with the Pilots in tow (ha ha), our cab driver, Ronald Scraders (who is their official driver) commented that Bermuda sorely needed rain. “Not TODAY!”, I exclaimed- a comment met with laughter. I expected optimal conditions; I needed them. Our ride was educational, with discussion of the roles that pilots play- in addition to steering passenger and cargo ships. Among them, is the vital task of search and rescue. Often, they are called to retrieve sick passengers off of passenger ships (of any size) and even individuals who are deceased. How heart-wrenching, and traumatic that must be- for families to experience a loss of that kind. I asked whether a woman had ever given birth on a cruise vessel; they were not entirely certain. Interestingly, I learned that- should a woman give birth at sea, the baby would be given the nationality of the country to which the vessel was registered. That could be anywhere in the world! I was particularly struck by the responsibilities at hand for these gentlemen, who number less than ten. Their territory encompasses the waters surrounding Bermuda. 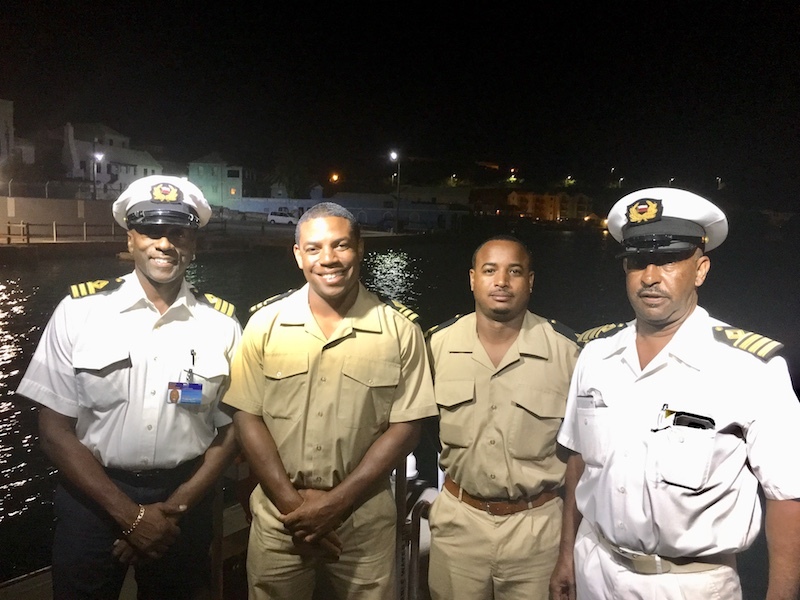 They are on call 24/7, including Senior Pilot, Michael Lightbourne; First Class Pilot, Anthoni Lightbourne, Jr.; Trainee Pilot, Rodrico Bean; Pilot Warden, Mario Thompson and the Pilot boat crew: Captain Edward Burchall, Jacal Minors and Tyrone Wales. We arrived in St. George in utter darkness. Everything proceeded like clockwork. Sitting in the harbor, awaiting our arrival was the pilot boat, St. David- a vessel typically manned by three men. To my surprise, it is a flat boat- appearing somewhat like a tug, but with a deck that has no barriers around the perimeter, whatsoever- it is just flush flat. It is designed this way for the purpose of search and rescue, yet is very dangerous to walk on, out on the open ocean. One must hold onto a railing. 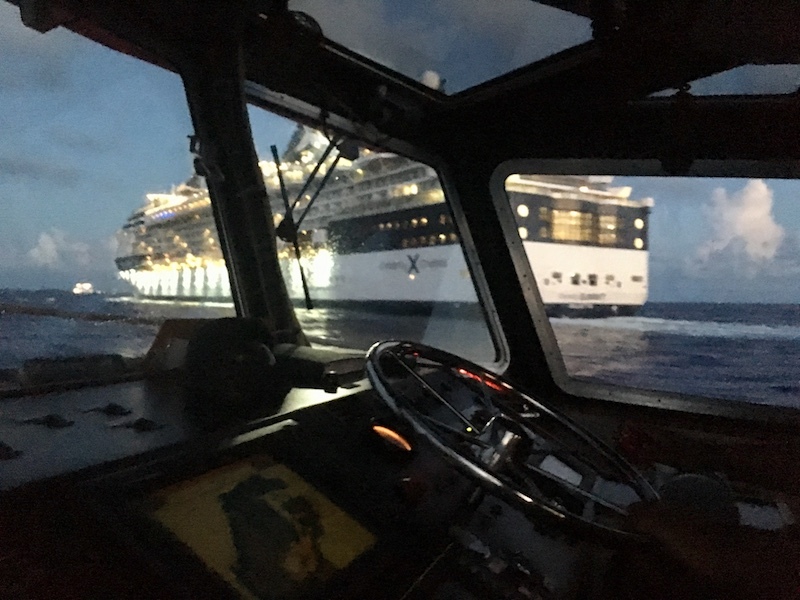 As the Pilot boat left the dock, with me onboard, I was informed of the rationale for our departing Bermuda at its East End, even though the cruise ships would ultimately dock in the West End. 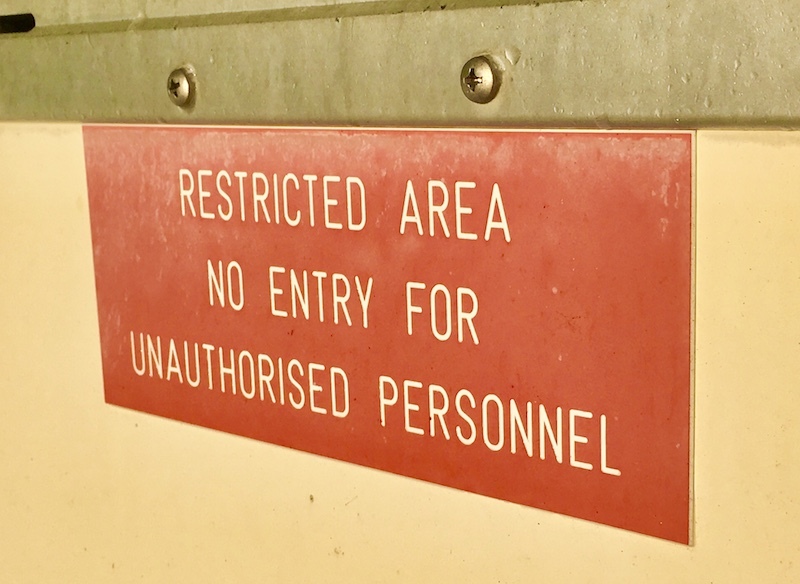 Answer: this is the ONLY entrance to Bermuda, for ocean-going vessels! “What do you mean, it is the ‘only entrance’?”, I asked.The pilot seated next to me made me laugh out loud. He said, “Do you know how many shipwrecks there are around the island of Bermuda?! It took 365 tries for them to figure out the proper entrance!” Point taken. Reefs, reefs, reefs! I was fascinated to cruise out to the ocean in darkness. As a non-mariner, I did not know that boats do not use headlights; they create a reflection. We were guided by dinky little green dots on shore (or rocks as it may be), as we exited the waters around St. George’s. 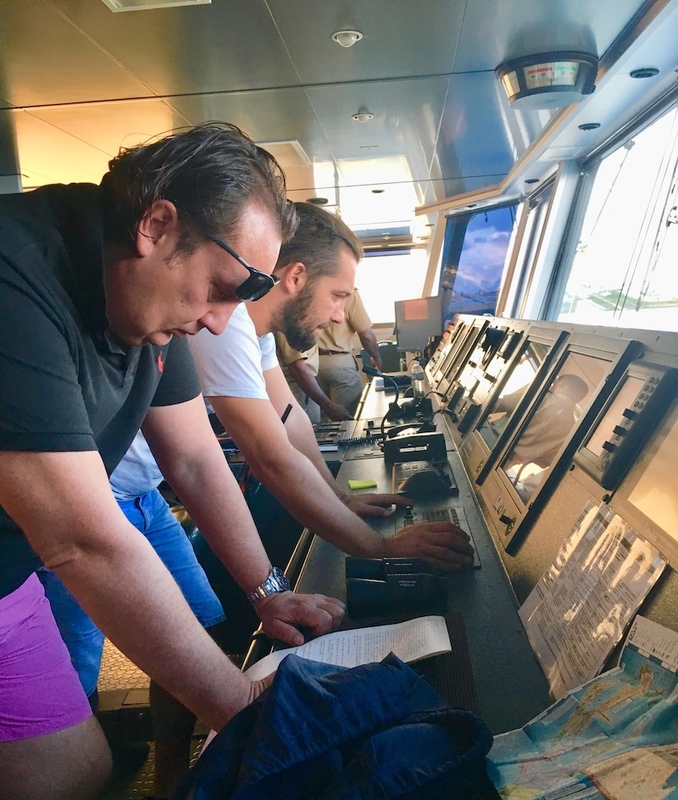 The team of pilots let me sit up front, next to the Captain- to get a bird’s eye view, as we visualized the vessels waiting for pilotage. In no time, we gathered speed. Bouncing along on the waves, I remarked to the Captain, “Gee, this is rocky! !” “This is nothing!”, he said. These gentlemen go out in all kinds of weather, risking their very welfare. The first stop was the Norwegian Escape, where our Pilot Warden bid us farewell. We cruised up to the side of the moving ocean liner. A rope ladder was dropped off of the NCL vessel. He climbed on, and up he went- to the bridge of the massive ship to become its interim Captain. Next stop, Celebrity Summit. We pulled up alongside it. 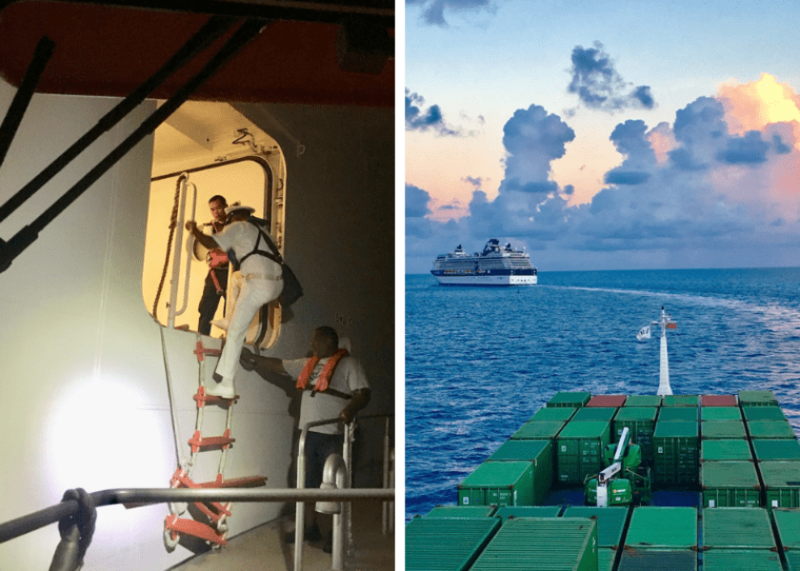 One of our Senior Pilots got out on deck, waiting for proximity to board the moving ship through a small door, located just above sea level. The water made the pilot boat rock. Timing must be optimal to safely board a moving ship! Okay…two down. 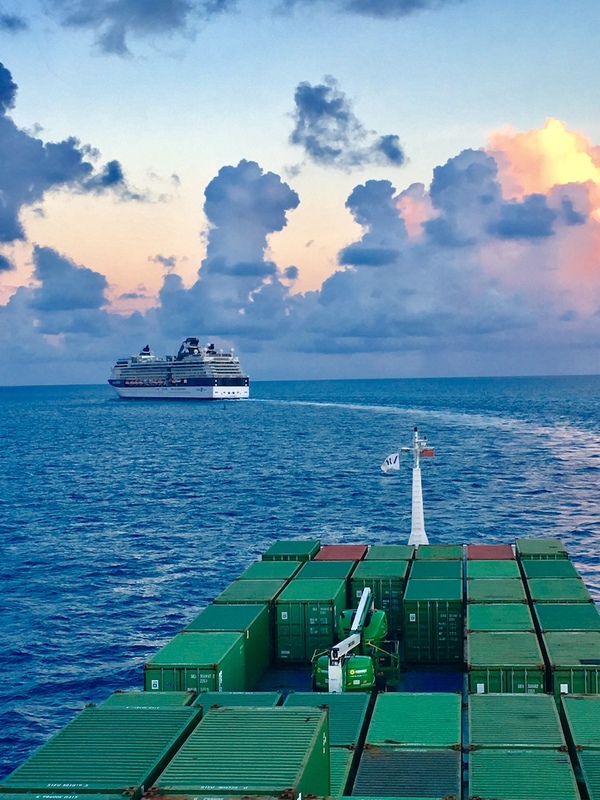 Now, we were off to the container ship- number three in line to enter Bermudian channels. As we neared “our” vessel, I recall blurting out an ‘unladylike’ term, as I realized that I would soon be climbing aboard a freighter! Yet, there was no time for heart palpitations (maybe a few) or second guessing, at this point. We pulled up to the Somers Isles. The climb up would be higher than the climb onto the cruise ships! My companion pilots said, matter of factly, “OK! Let’s do this!” Thank God, human beings are endowed with Adrenaline. One of my comrades went ahead of me- demonstrating the timing of the climb. 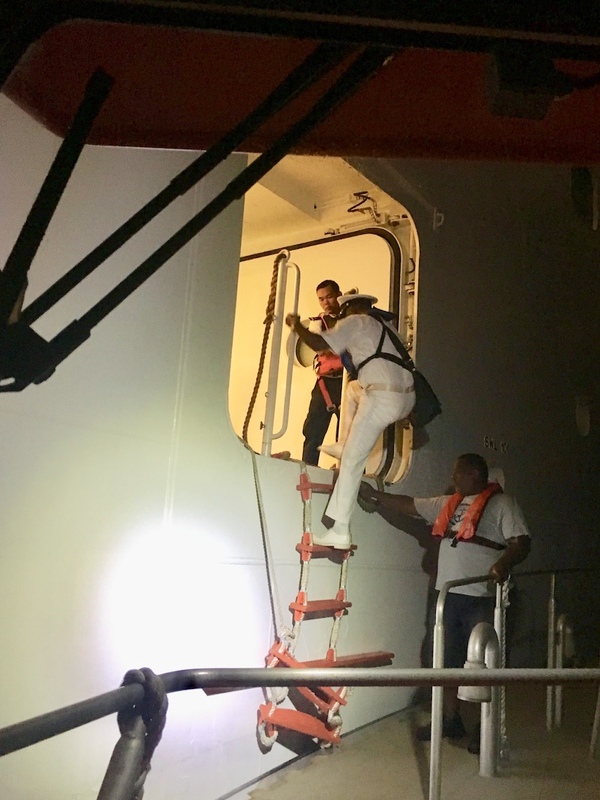 Similar to when you are jump roping, and there is a time to ‘jump in’, there is an optimal time to put your foot on the rope ladder- when the pilot boat heaves high. This was business, and I was coached “Grab on now! Climb up!” The rest is a blur. It wasn’t extraordinarily high, but it was indeed a moving vessel in the dark ocean. Thankfully, the second pilot came onboard behind me, making sure that I did not become the first ‘dumb’ writer to cause very bad PR for Bermuda. Once onboard, I felt euphoria. I was damn ready for a cup of coffee! But, we had not yet arrived on the bridge. We would climb up many flights of wet salty stairs in the open air, to reach our destination. The railings were so moist and gritty from salt, I am certain that I exfoliated my palms. As we stepped inside the bridge cabin, from which the ship is steered, I breathed a huge sigh of relief. The vantage point of being on that ship is something that will be permanently etched in my mind- not to mention the camaraderie and professionalism of those who were my hosts- including the Captain of the ship, here from Holland (who was sporting pink Bermuda shorts!) and his First Officer. I sipped hot coffee from a thin aluminum mug, and drank in the vistas- popping outside occasionally onto the narrow deck that surrounds the bridge, to catch the breeze and try to absorb what my eyes were seeing. My mind considered the life of a ship’s Captain, living out in the vastness of the ocean. This huge vessel had merely a crew of eight. Unbelievable! As the Bermudian pilots guided the vessel along, a high pitched beeping sound emanated from a printer, that reminded me of morse code messages from yesteryear. Sure enough, it was a warning- an update on Hurricane Florence. 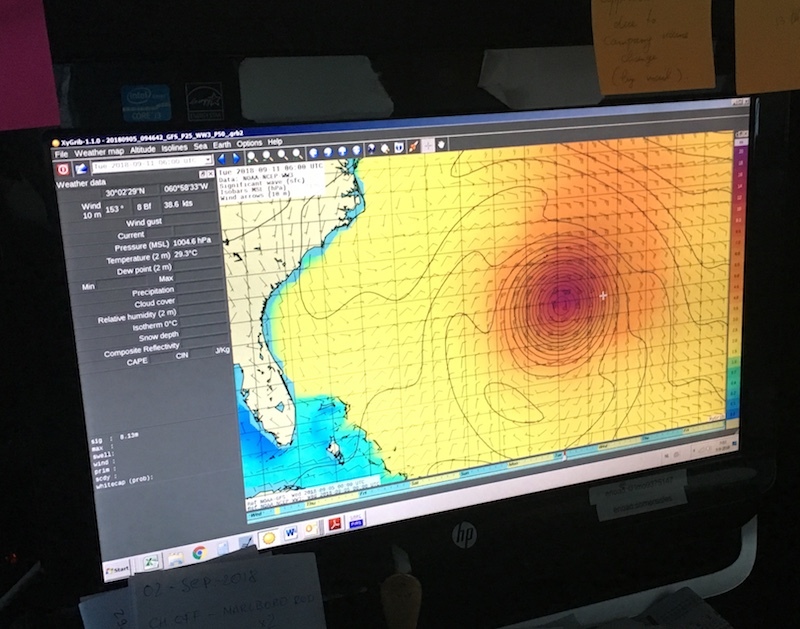 The ship’s First Officer showed me the weather radar screen, with Florence appearing in red. The Captain read the digital printout, relieved to know that Florence should not be a threat while his vessel was in Bermuda. As the sun rose, three ships were in (or near) their destined Bermuda’s ports. 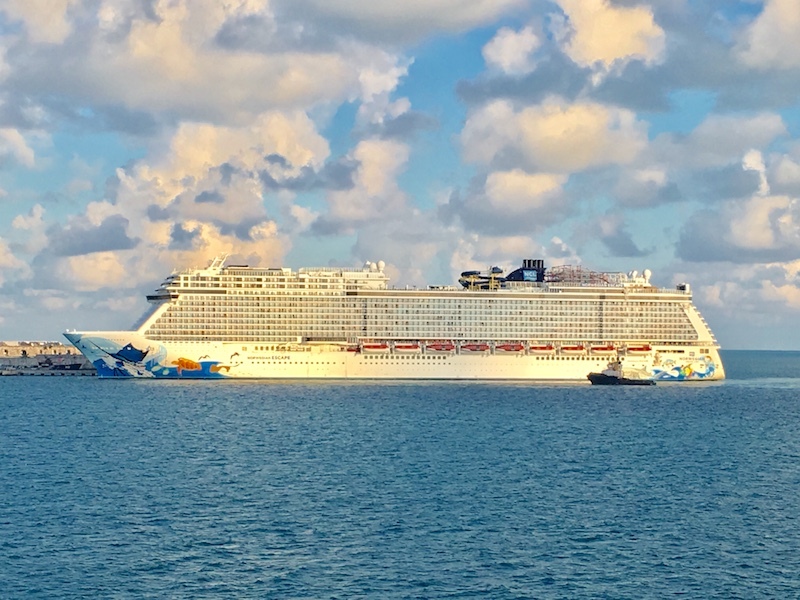 The Norwegian Escape was safely parked at Dockyard. As we passed, I waved to the Pilot Warden, knowing that he might still be on the bridge. He texted me to ask how things were going. I replied, “I am waving at you right now!” A bridge to bridge hello. Having witnessed Fort St. Catherine in miniature from the sea, and now the Clocktower Mall, it was time to navigate between rocks, into the channel to Hamilton. 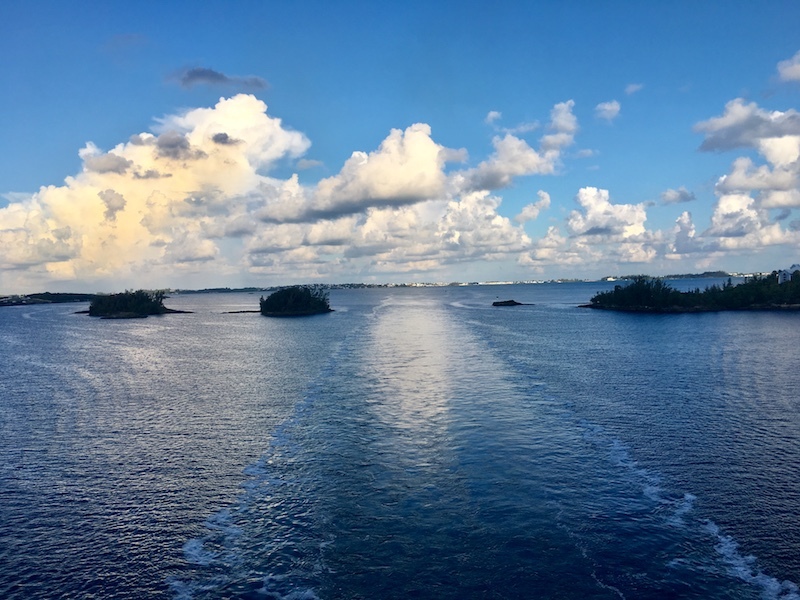 Onboard, we were carrying eagerly anticipated cargo from Florida- everything from toilet paper to tropical fruit to a full-sized swimming pool. As we entered the channel toward Bermuda’s capital, one could see the treacherous rocks on either side of the ship. We had an advantage, because the bow of our ship was a flat bed for cargo. My pilots explained that other taller vessels- cruise liners and oil tankers- are much more difficult to bring in, because the bow of the ship is higher than all of the rocks on the periphery, making it very difficult to see; precision is needed. 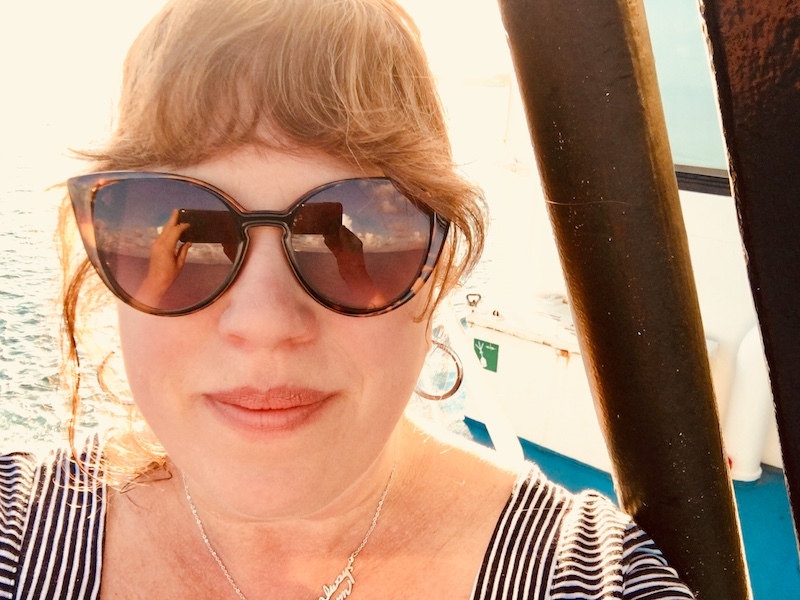 As we glided along in the Great Sound, entering Hamilton Harbor, I waved to my Bermuda family at Salt Kettle Guest House, and to individuals on smaller boats. Upon arrival in Hamilton, I had the feeling that a child gets- when a carnival ride is over and you have no more tickets left. I wanted to go on the ride again. 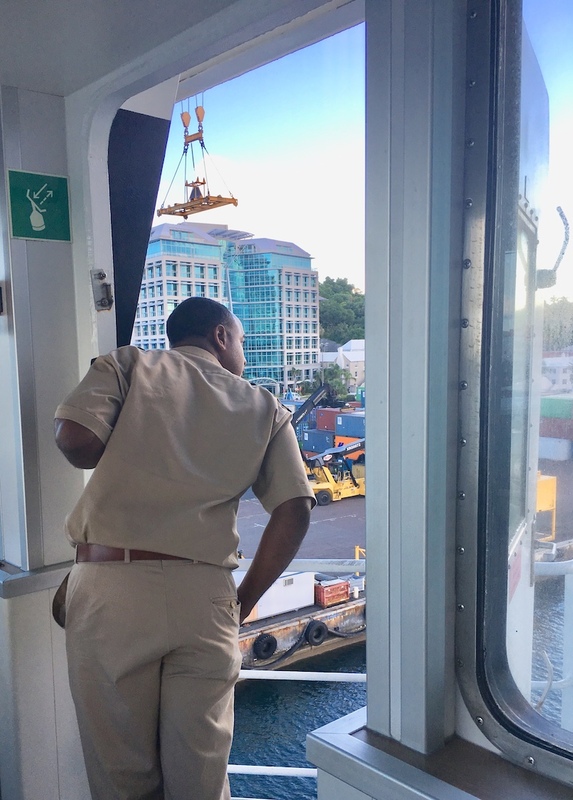 Now at Port, the ship’s native Captain was responsible for docking, and making sure that necessary paperwork gets completed for local authorities. Thus, another hand-off takes place. The Bermudian Pilots are free to debark. It was time for us to walk back down the salty wet flights of steps onto the deck for exit. 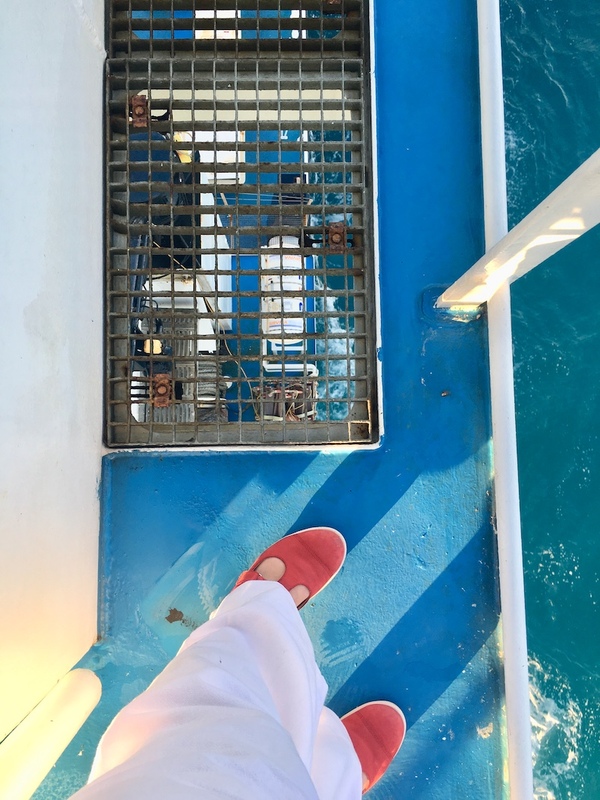 Walking down the plank, off of the ship, I thought about our “discrete” arrival in Bermuda’s port city- so different from flying in, the usual way. Prior to 9:00 am, my sea adventure (I should say ‘sea venture’*) was over. A “mission accomplished”. As I parted ways with the very special pilots who made my morning a lifelong memory, I headed into town to celebrate. Who is open for breakfast, I thought…? With special thanks to: Government of Bermuda, Bermuda Marine and Ports, Pilot Warden Mario W. Thompson, Captain and crew of Somers Isles, and the Bermudian Harbor Pilots who dedicate their lives to keeping Bermuda afloat. 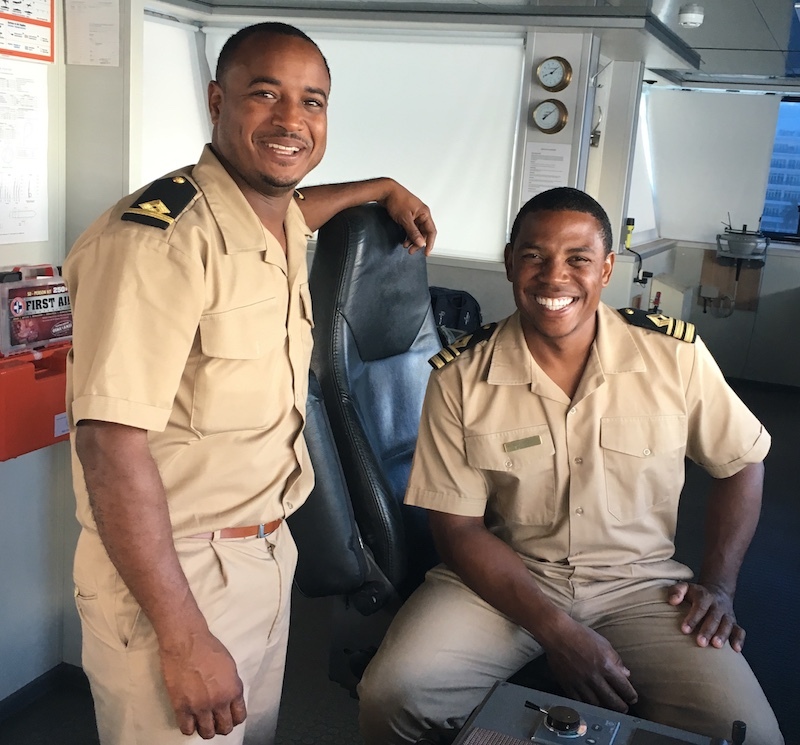 These gentlemen put themselves at risk, on a daily basis, to sustain the island’s economy and to ensure the safety of everyone in Bermuda’s waters. 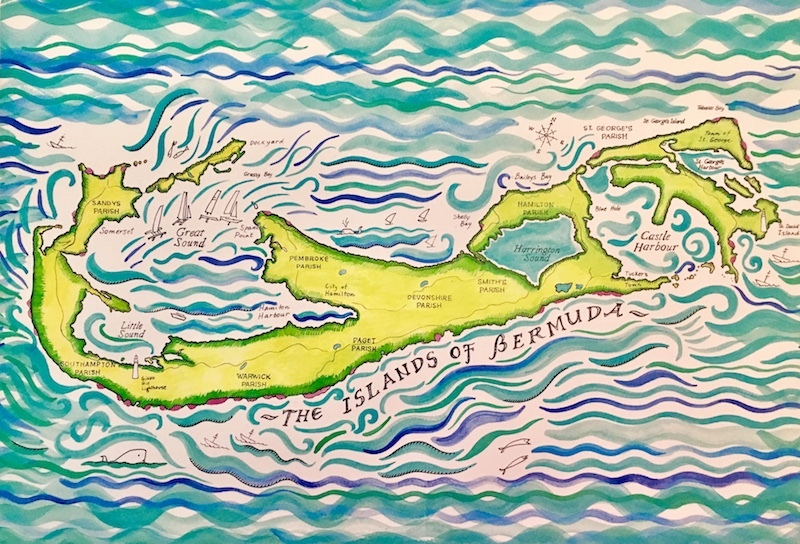 Art credit (map of Bermuda) to the wonderfully talented Barbara Finsness, artist and proprietress of The Island Shop on Queen Street. *History note for non-Bermudians: The Sea Venture is a ship that attempted to sail from Plymouth, England to Jamestown, Virginia in 1609. Due to a severe storm, it landed in Bermuda, bringing the first colonists to the island.